A chemical formula of a compound is defined as a symbolic representation or notation of atoms constituting an element. The chemical or molecular formula identifies the number of particular atoms of each element present in a compound. The molecular formula depends on the combining capacity or valency of the elements. Therefore valency is used to find how the atoms of an element will combine with the atom(s) of another element to form a chemical compound. Sometimes in chemical formula subscripts are also used to represent the ratio of elements in the ionic or non molecular compounds. In case of ionic compounds, chemical formulas are termed as Empirical Formulas. The valency or charges present on the ion must balance each other. 2. Formula for Magnesium Chloride: As the charges on magnesium and chloride ion is 2+ and 1- respectively. Therefore 2 chloride ions are required to balance single magnesium ion. When a metal and non metal constitute a chemical compound, then the symbol of metal is written before the symbol of non metal. 1. 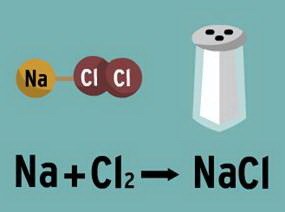 Formula for Sodium chloride: As sodium is a metal and oxygen is a non metal therefore sodium is written first while oxygen is written after it. When polyatomic ions form a chemical compound, the number of atoms is written after enclosing the polyatomic ion in brackets. 1. Formula of calcium hydroxide: The formula of calcium hydroxide is written as Ca(OH)2 .Here, the bracket around OH with a subscript 2 indicates that there are two hydroxyl (OH) groups joined to one calcium atom. 2. Formula of calcium carbonate: In this example, brackets are not required as it contains only one ion. Formula for Calcium Oxide: As the valency of calcium and oxygen is same but to simplify the formula we write CaO instead of Ca2O2. Write the chemical formula of Magnesium carbonate, Phosphorus penta chloride, and Hydrogen sulphate. Try to answer. Still need help? Want to know more about writing chemical formulas? Click here to schedule live help from a certified tutor!